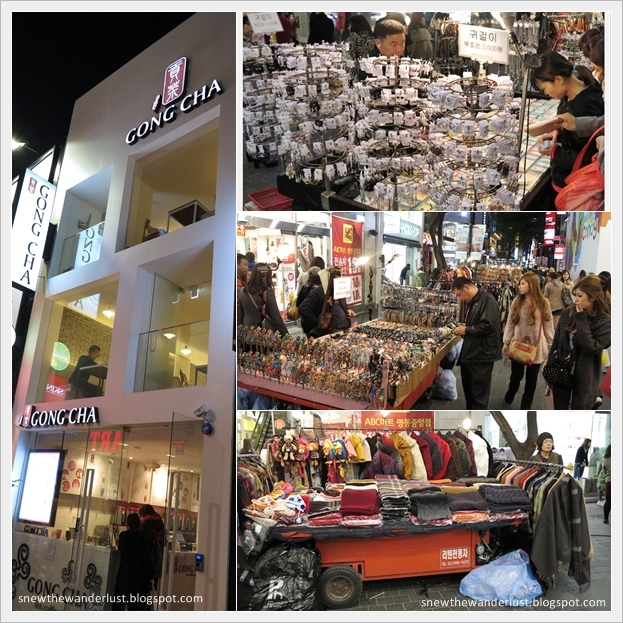 Myeongdong, the "must-visit" shopping street in Seoul. This is the only place in Seoul that I will never fail to visit. And the only place that I am familiar with, in Seoul, before this trip. Myeongdong is the main shopping area where locals and tourists shop, probably similar to the Orchard Road in Singapore, but a more vibrant version. This is also the place where one is spoilt for choice on Korean cosmetics and skin care products. Faceshop, Etude House, Natural Republic and many more. As you approach the shops, the staff would hand out the packs of facial cotton as free gifts to entice you into the shop. You will be surprise that the staff speak conversational Mandarin. Infact, they are more fluent in Mandarin than English. Chinese are big spender tourists everywhere these days. Myeongdong Theatre, a prominent building in Myeongdong showcase the popular Nanta Cooking Show. The actors using knifes, pots and pans to create music and dance with it. We do not have watch the show but this was highly recommended by my Korean pals. Street food and street stalls are another highlight of Myeongdong at night. The roads are closed to traffic from the evening to midnight. The street food commonly found in the street stalls is "Ddeokbokki". Ddeokbokki is the Spicy Korean Rice Cakes. The pot of red gravy looks too spicy for me to try! Papa Snew salivate at the Kebab. He simply loves Kebab. But the irony is, he has never been to the Middle East nor Turkey to taste the original ones. And yes, we found Gong Cha in Myeongdong. The Gong Cha over here is a cafe selling the bubble tea, instead just the usual take-away stalls found in Singapore. Infact, this particular one in Myeongdong is three-storey high. Myeongdong is definitely a place to visit during the night. But if you are there during the day, do also check out one of the tourists sight - Myeongdong Catheral. It was under renovation when I visited it. Otherwise, the Gothic structure would be really impressive. Across the road from Myeongdong Shopping Street is the Lotte Town, just next to our Lotte Hotel. Lotte Town has two adjacent shopping malls - Lotte Departmental Store and Young Plaza. Lotte Department Store house the Avenuel and the Lotte Duty Free Shop (on 9th to 11th floor) are located in the Lotte Departmental Store. Lotte Young Plaza has good fashion clothings, more for the younger crowd. Luxury and branded products are much cheaper in Korea. Tourists can claim for tax refund or just purchase from the Lotte Duty Free, where we got really good discounts. But do visit early, the duty free located on 9-11th floor is always packed with tourists from Mainland China. For better shopping experience, do try to shop during less crowded timings.